A few issues here and there considering the price, but the MPK88 is a fine 'board with a great keybed. Very playable and nicely weighted keyboard with aftertouch. Lots of control. DAW templates available. Easy to use, on the whole. Only one set of MIDI ports. Only two keyboard zones. 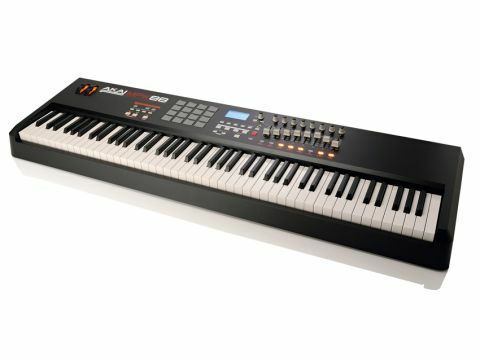 The MPK88 - an 88-note MIDI controller keyboard - is a beast. When it first arrived we were shocked by its size and bulk. It weighs in at a pretty weighty 67lbs (30kg) so make sure there are two of you around to unbox it and set it up. It's a good-looking machine, in keeping with the MPC, MPD and MiniAK products. On the whole, everything feels well made, with the main case made of tough black plastic on a metal chassis. The rotary dials feel smooth and have little play in them and the buttons all have a reassuring click. However, the sliders feel a bit flimsy with lots of sideward play and we're not sure how well these would stand up, particularly on the road. Disappointing at this price point. Fortunately the weighted hammer-action keybed is impressive. In fact, it's one of the best we've played. It's not too light or heavy, has none of the sponginess and slow key return that plagues some hammer actions and it's well suited to all types of playing, including Clav or organ styles. Connections include USB for powering the MPK from your computer, a wall wart power adaptor socket (though it's tight of Akai not to include one!) MIDI In and Out (but why not two sets of MIDI ports?) two footswitch jacks and an expression pedal jack. A quick scoot around the panel shows a large number of controls. First up there are the obligatory pitch wheels, backlit in yellow. To the right are controls for splitting the keyboard and for selecting the 16x4 MPC pad banks. Below are controls for switching the MIDI-syncable arpeggiator on and off, a latch switch and the Note Repeat function that's lifted from the MPC range for playing rolls and inputting notes (you hold the Note Repeat button and hold a pad and hey presto instant 16ths or 8ths etc). "The weighted hammer-action is well suited to all types of playing, including Clav or organ styles." The pads feel OK, but they could definitely be a little thicker like those on the MPC-1000 as they do bottom out quite easily. In the middle of the board is a clear and informative blue backlit screen. Presets (which contains all the front panel assignments) are displayed at the top with MIDI channel and controller assignments/other info displayed underneath. Below are the transport controls for your DAW's sequencer. It's very easy to navigate the menus, plus there's an included PC/Mac editor (and a Lite version of Ableton Live too) which makes things even easier if required. All in all, this is a well-built, user-friendly and pretty versatile controller board with a great keybed. There are a good number of controls available and all are generally easy to map, plus the MPK comes with several presets to get you started with most types of DAW software. But why no preset mapping template for Logic Pro? Right now it all has to be set up manually. We'll be watching that website for updates. In fact, we spent a good while head scratching, trying to map and sync the transport controls to Logic's (though mapping the rotaries was easier). And why can this massive keyboard only be zoned into two areas? These are the negative points, but if they don't affect your mode of working, the MKP88 comes highly recommended.